Carte de la Californie suivant. I. La carte manuscrite de l'Amerique de Mathieu Neron Pecci olen dresse a Florence en 1604. II. Sanson 1656. III. De L'Isle Amerique Sept. 1700. IV. le Pere Kino Jesuite en 1705. V. La Societe des Jesuites en 1767. This is a rare and important map of California in five different states, ranging from roughly 1656 to 1767. Engraved by the important French cartographer Robert De Vaugondy, for the c.1770 edition of the Denis Diderot (1713-84) Encyclopedie, this map explores the confused state of California cartography in the late 18th century. It examines the gradual discovery of California through various seminal mappings. Initially uses the work of Italian cartographer Matheau Neron Pecci (1604) which correctly presumed that the main body of California extended southward into a peninsula. The next map illustrated, by N. Sanson in 1656, displays in insular California. Map no. III, by Guillaume Delisle (1700) reattaches California to the mainland, returning to the early peninsular theory. Next, Vaugondy exhibits part of the seminal Kino Map. This map, rendered by a Jesuit missionary c.1705 was the work that finally disproved the California Insular theory. Father Franz Kino walked this region between 1698 and 1701. 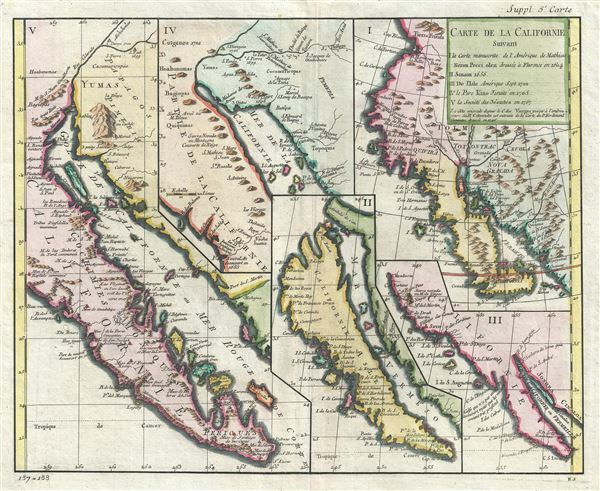 The final map, produced by unnamed Jesuits c. 1767 is a somewhat accurate depiction of the Baja California peninsula. These maps all predate the discoveries of Captain Cook's voyages and hence Diderot's work was as much speculative as historical. A fine example of an essential work for all serious California collections. This map is part of the 10 map series prepared by Vaugondy for the Supplement to Diderot's Encyclopedie, of which this is plate 5. This seminal map series, exploring the mapping of North American and specifically the Northwest Passage was one of the first studies in comparative cartography. Supplement to Diderot's Encyclopedie, ou dictionnaire raisonne des sciences, des arts et des metiers. or Vaugondy's Recueil de 10 Cartes Traitant Particulierement de L'Amerique du Nord, (1779). Tooley, R. V., Landmarks of Mapmaking; an Illustrated Survey of Maps and Mapmakers, p.215. Tooley, R.V., The Mapping of America, p. 134, #100. McLaughlin, G., The Mapping of California as an Island: An Illustrated Checklist, #241. Fite, D. E., and Freeman, A., A Book of Old Maps, Delineating American history from the Earliest Days down to the Close of the Revolutionary War, #52. Heckrotte & Sweetkind #15. Wheat, C., The Mapping of the Transmississippi West, 1540-1861, 160. Pedley, Mary Sponberg, Bel et Utile: The Work of the Robert de Vaugondy Family of Mapmakers. 474. Leighly, John, California as an Island; an Illustrated Essay, 177. Schwartz, Seymour I. and Ehrenberg, Ralph E., The Mapping of America, p. 136. Wagner, Henry R., The Cartography of the Northwest Coast of America to the Year 1800, Vol II, 637.